The stairs leading down to our basement had looked pretty terrible for a long time. The solution to make it look about a thousand times better, but on a budget? 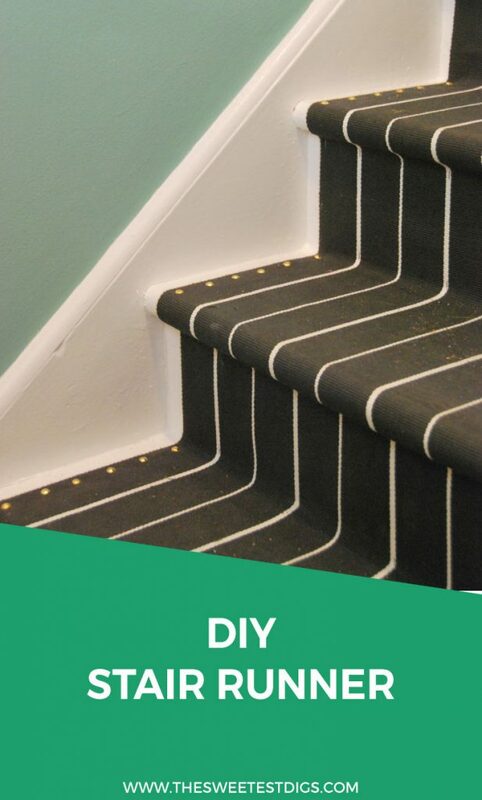 A DIY stair runner. Keep reading… you won’t believe where the runner carpet came from … !! Looking down from that landing is the main part of the staircase where our basement apartment tenant walks up and down everyday. It had some suuuuuper cheap blue carpet thrown down as a runner. 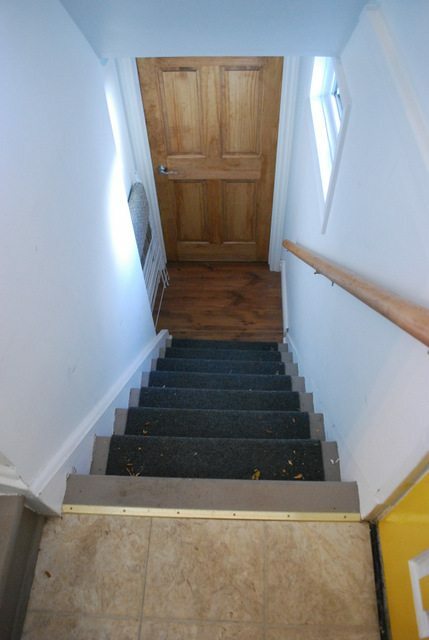 And the second part of the staircase, which leads up to our main floor, had nothing. Just this god awful gray paint that showed every spec of dirt. I knew I wanted a new runner on there – one that was darker in colour so it would help hide any dirt, but something attractive. 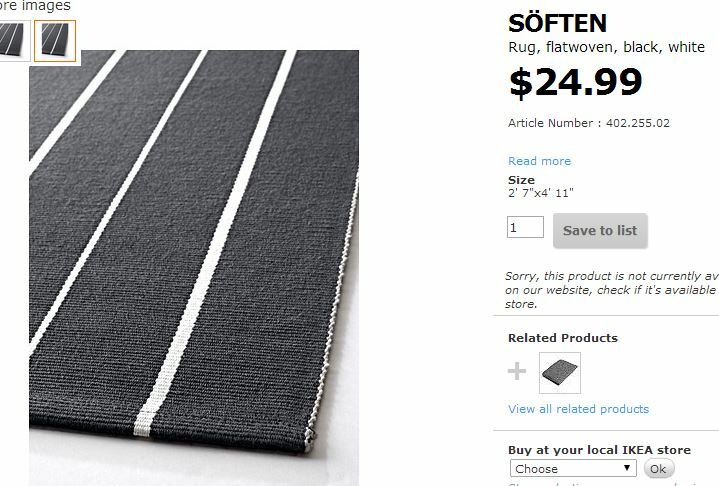 I went to IKEA to see what they had, and came across the “soften” rug. 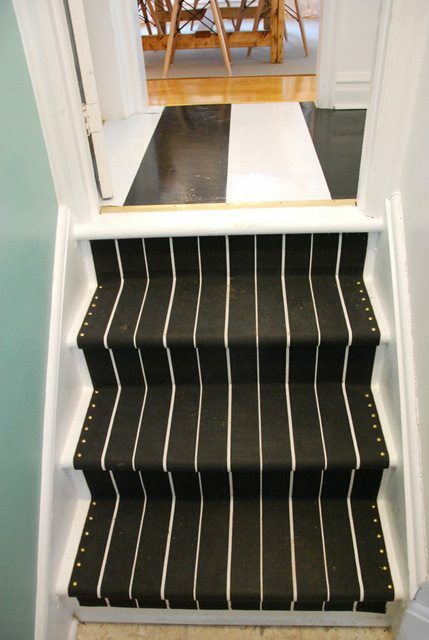 It’s a small, flat woven rug that happened to have the perfect width for our stairs. 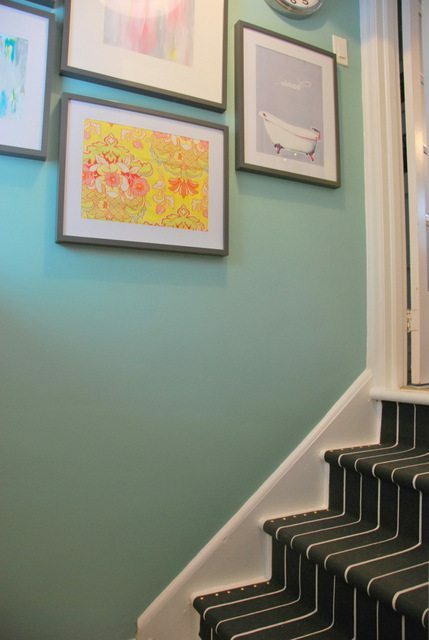 We needed 5 of them to cover our whole staircase, and at $25 a pop, it was within our budget. 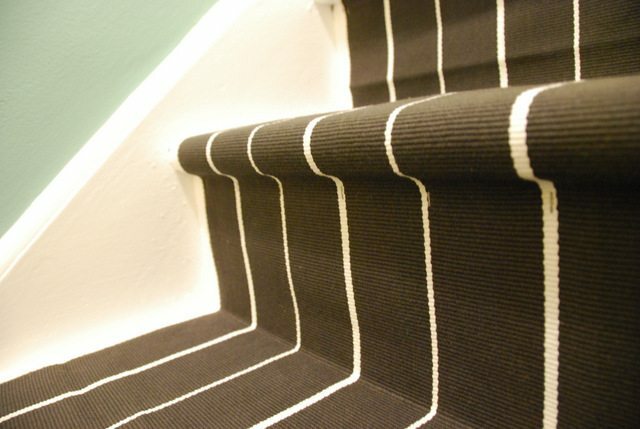 Before getting started I did a bit of googling around to see what other DIY stair runners look good. And you’ll never guess what I ended up stumbling on? 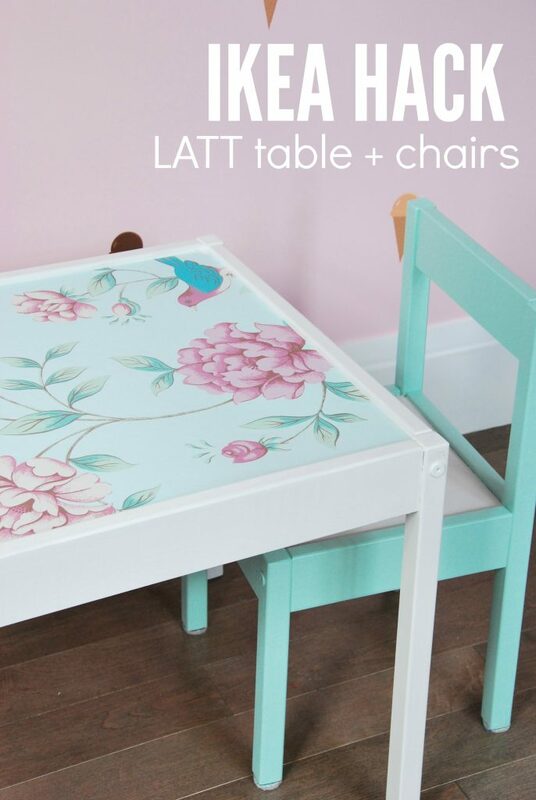 Jenny, from Little Green Notebook, and who has amaaaazing style, had done this exact project using the IKEA Soften rugs! Clearly we were on the same brainwave. And the best part? I was able to follow along with her tutorial. 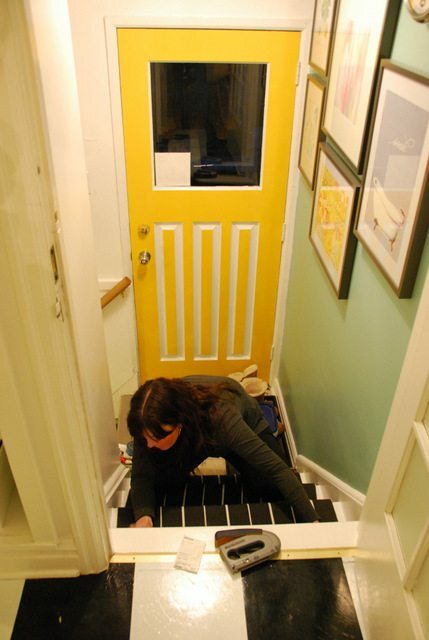 DIY Stair Runner – Out With The Old, In With IKEA! 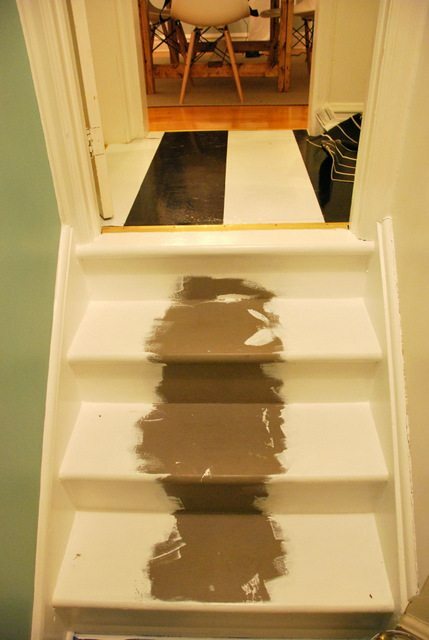 The first step was to rip up the existing runner, and then give the stairs a coat of paint. I used a high gloss white paint that would be super durable, and only had to paint the side of the treads and risers. Then it was time to break out the rugs, some scissors, a ruler, and my staple gun (this Stanley staple gun is awesome and a must-have DIY tool!). 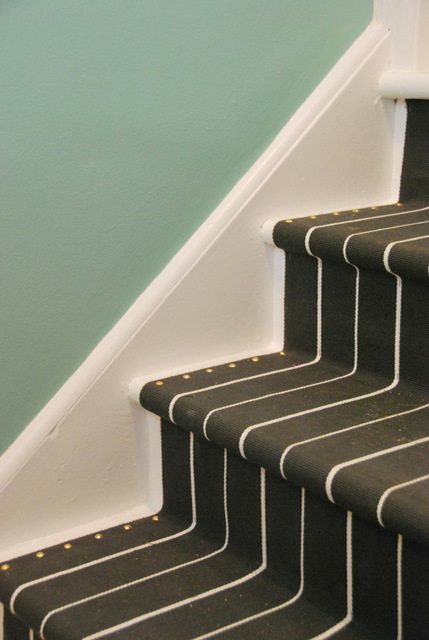 I lined up the rug at the top of the stairs and measured out the space on either side to ensure it was even. Once I knew that number, I went and made little marks on both sides of each step, as a guideline to follow when my rug got to that step. Then it was just a matter of stapling the rug down. 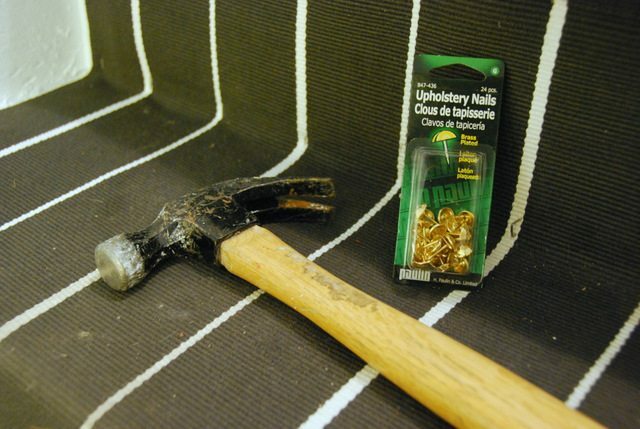 I followed Jenny’s instructions of using 3/4″ brad nails (you can grab these ones – also by the Stanley brand). I started by stapling under the lip of the top stair, and then pulling the rug tightly down the riser, and staple it along the bottom. Then once again pull the rug over the tread of the stair, back down under the lip, and staple. I would start with say 4 staples under the lip to get the rug in place, and then add another bunch of staples to ensure it was secured really well. I found that the staples were best placed near each white stripe (I would try to get it at the border between the white and the grey), and would staple vertically — in line with the stripe. In the pic below you can see a few of the staples right under the lip of the top tread, and then there are some again at the bottom of the riser. When I came to the end of a rug and it was time to staple down a new one, I would cut the previous rug right underneath the lip of the tread, and then staple the new one overtop, matching the stripes as well as I could. 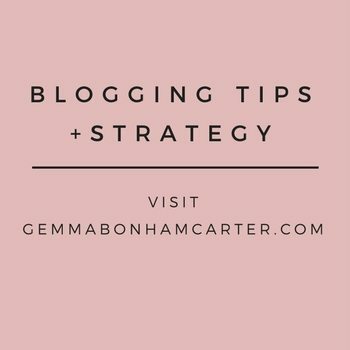 Again, check out Jenny’s tutorial as she gives good step-by-step pics. 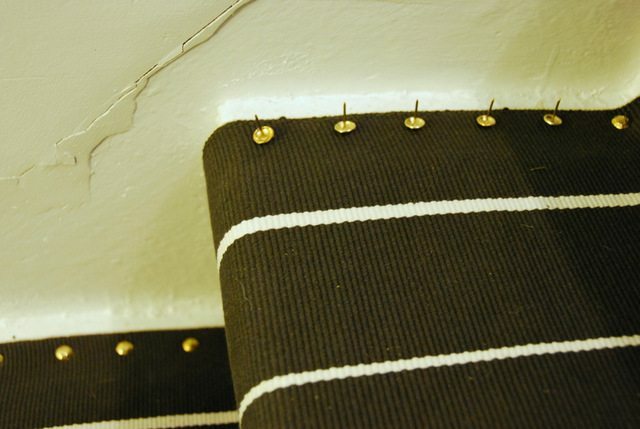 Once everything was stapled down, it looked great but I wanted to add some upholstery nails down the sides for both style and extra security of runner to stair. I grabbed some gold ones from my local hardware store, but these Dritz Home ones are an exact match. I played around with the placement and decided on 6 nails per tread. I would eyeball them and lay them face up on the tread (lazy DIY’ing, and didn’t measure each one exactly), and then hammer ’em in. It didn’t take much time at all and definitely added a nice element to the project. I also think that it helps keep the runner a little more secure along the edges. So much more clean and crisp, right? I like the combination of the teal with the dark grey, white, and hint of gold. 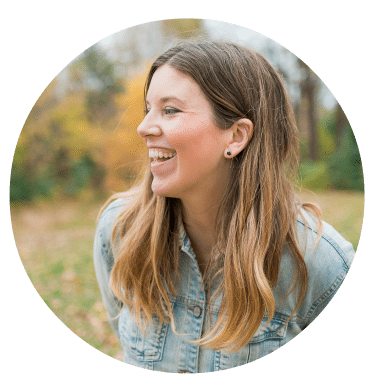 DIY Stair Runner – Finished! Full disclosure? I actually did this project last year… when I was still pregnant! I had totally worried that since we didn’t put a rug slip pad down, or because it was a series of small rugs, that it wouldn’t hold up. So I waited to put this one through the test of time before posting. And guess what? Other than a bit of fading over this last year, it looks as good as new and the whole runner has totally stayed in place. DIY win! And in case you’re wondering, the total cost was around the $150 mark- definitely really reasonable for how many stairs we needed to do. 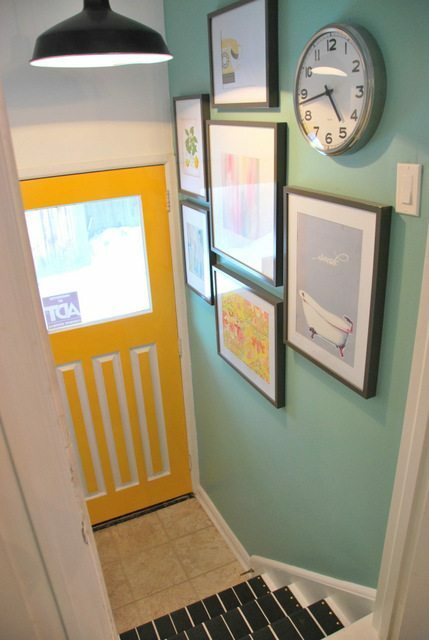 If you want a ton more DIY project ideas, head on over to The Project Gallery. 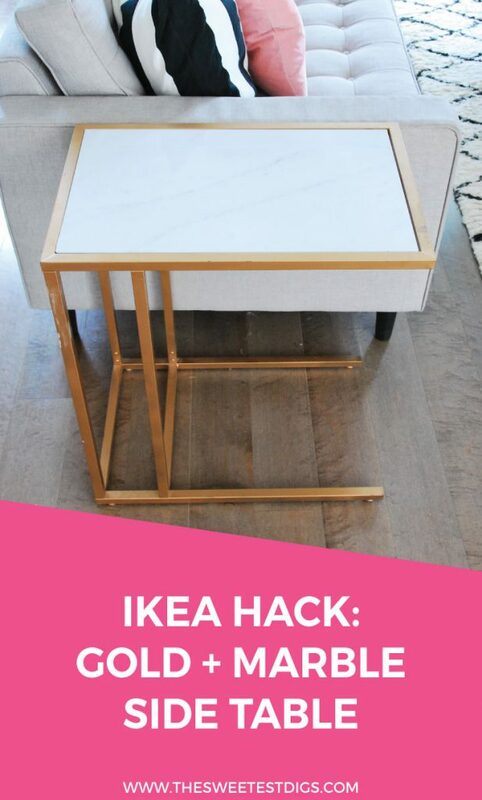 There are lots of sweet ideas over there, like more IKEA hacks!! 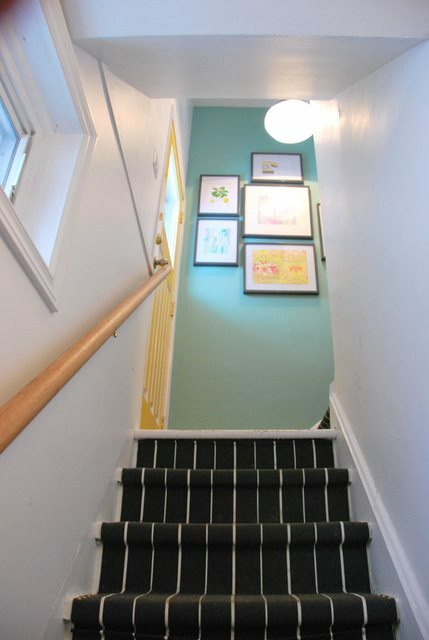 Do you guys have stairs in your home? Do they have runners or are they left bare? Spill! 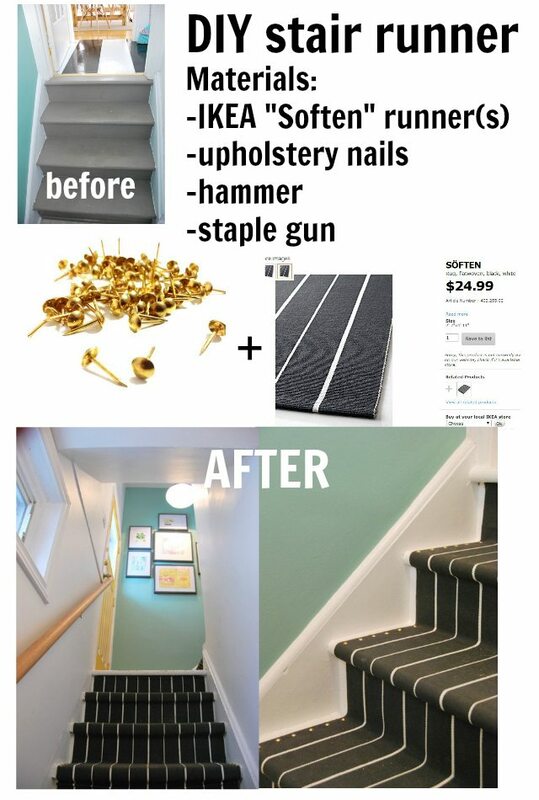 Your post was very helpful for me redoing our stairs! 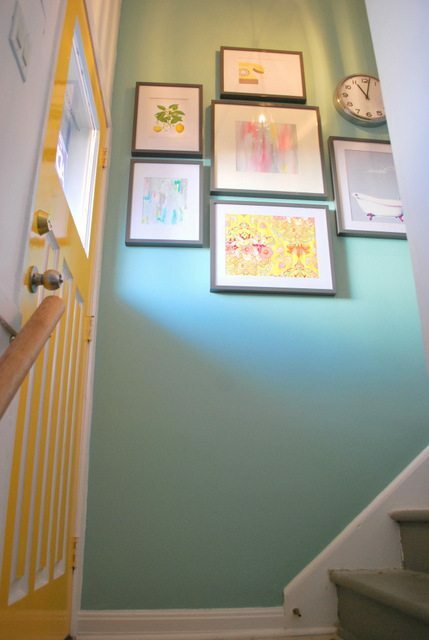 My plan had been to strip the ugly paint off our stairs and stain the wood, but I found that to be far too much work. Instead I painted them a better color and ran runner rugs down them from Wayfair. I am so happy with how they turned out! We have a multilevel with shorter flights of stairs (3 total), so the 8-foot rugs were just about right without me needing to do any cutting even! Which made things easier. And it ties the whole house together now! Amazing Anna!!! 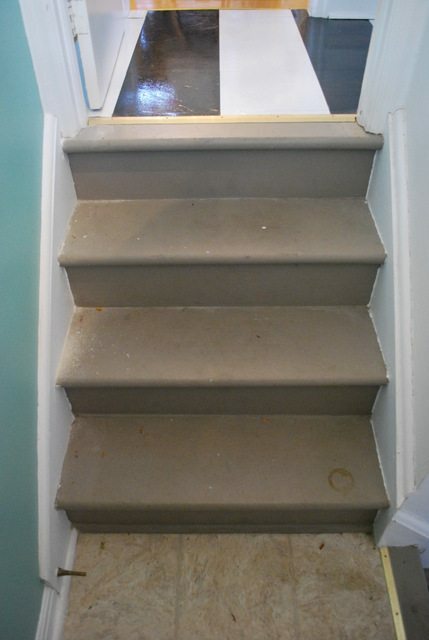 I’m so glad the post was helpful and your new stairs look stellar!! !